Who is behind the lovely logo and graceful graphics of Holiday Staff? Thousands of budding entrepreneurs launch businesses, and try to carve out a niche for themselves. So what? But what makes those businesses unique, newsworthy or an interesting prospect is their back story, and their future vision. I’ve been told to ‘make it personal’ – a kind of ‘meet the maker’ scenario, if you will. I’m not one for self promotion, but I’ll go all out to promote my business, which I believe offers a much-needed service to benefit both businesses and job seekers. So I’m happy to share my story, as I think that makes Holiday Staff what it is, and what it can be in the future. summer in bucolic idyll was no easy task. 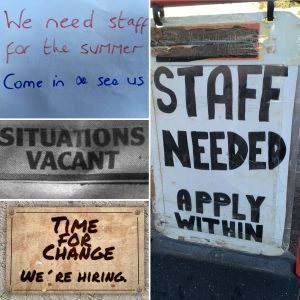 For so long, recruiting seasonal staff has simply been to advertise on a postcard in a local shop window, and hope that the right person sees it, or take out a fairly pricey advert in a local newspaper, which lasts for only seven days (if you’re lucky), before it becomes fish and chip paper, or gets stuffed into wet shoes! everything is moving online. Good or bad, it’s a move that can’t be challenged, and so I felt the process of finding seasonal staff and summer jobs had to follow. Typically, the majority of seasonal jobs are carried out by the young and their lives are online. You have to keep up or miss out. It is really important for people to take on seasonal work – for some, it’s a rite of passage, a little taste of what the world of work is like. I believe strongly that taking on any job gives a sense of self-worth and confidence. It shouldn’t be a struggle for youngsters to find their first summer job (or Easter, winter or ski – we cover every season! ), and it shouldn’t be a case of ‘who you know’ or, as is often the case, ‘who your parents know’! Give job seekers the relevant tools to source their own jobs, and they could really surprise you, and themselves! So, after a lot of research, thought, questions and yet more research, Holiday Staff was launched, in a bid to make sourcing seasonal staff easier, both for my family and the wider world! interested in those roles can apply direct to the employer through our site. And the good news is that it seems to work. Europe. Some offer live-in accommodation, and some are asking for people who live only two miles away. Some are looking for qualified sports coaches or chefs, whilst others want a cheerful personality, good customer service and a willingness to scoop ice cream! Whether it’s a large company looking for 50 seasonal workers across Europe, or a small family-run tourism business looking for one dedicated person, we offer the same commitment to each individual vacancy, and will promote each job equally. Seasonal jobs are the future! online platform for seasonal vacancies (lots of coffee involved whilst the business develops!). We’re a UK-based family-run business, not a multi-national corporation keen to put another £10million in the bank (although some pennies for the coffee would be good!). We duly pay our taxes, and have plans for charity collaborations in the not too distant future. So please share this post, follow our social media accounts (on our home page), ask anyone you know to place their seasonal job advert with us, and apply for any vacancies you like the look of! And you never know, you could be working with my family at some point!